Congratulations to Lindsey and James!!! 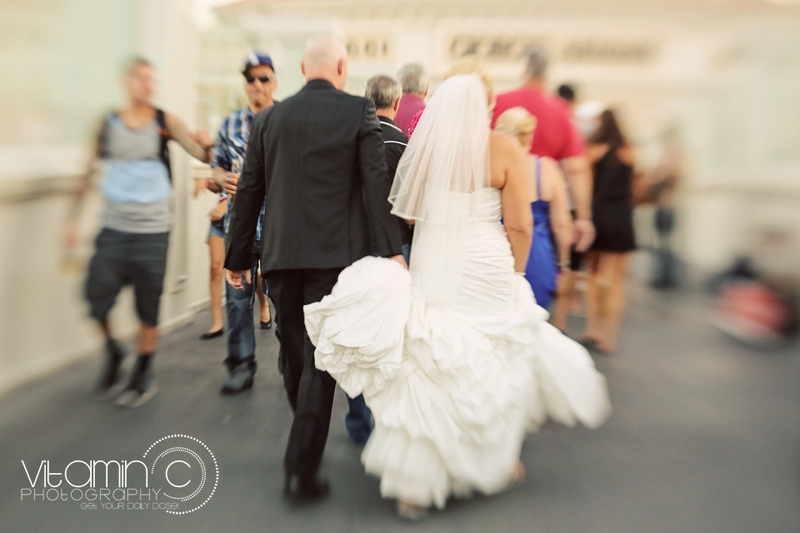 Our neighbors to the north decided a fast paced, exciting wedding was more their style, so they packed up their getting married clothes and left Canada behind to get hitched here in Vegas. 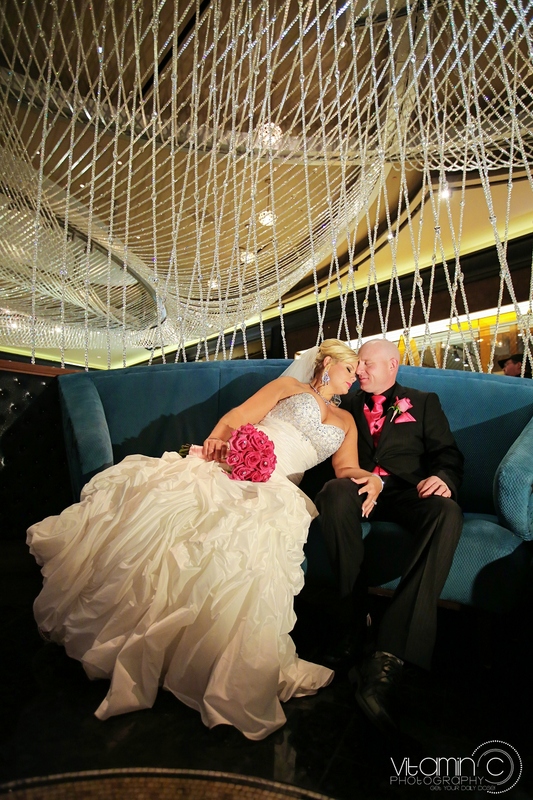 I met up with Lindsey at her suite in the Mirage where she was excitedly getting ready for her big day. Lindsey definitely came prepared; her gorgeous wedding dress was equipped with crystal sequins, a ton of ruffles and even a 5 foot train! 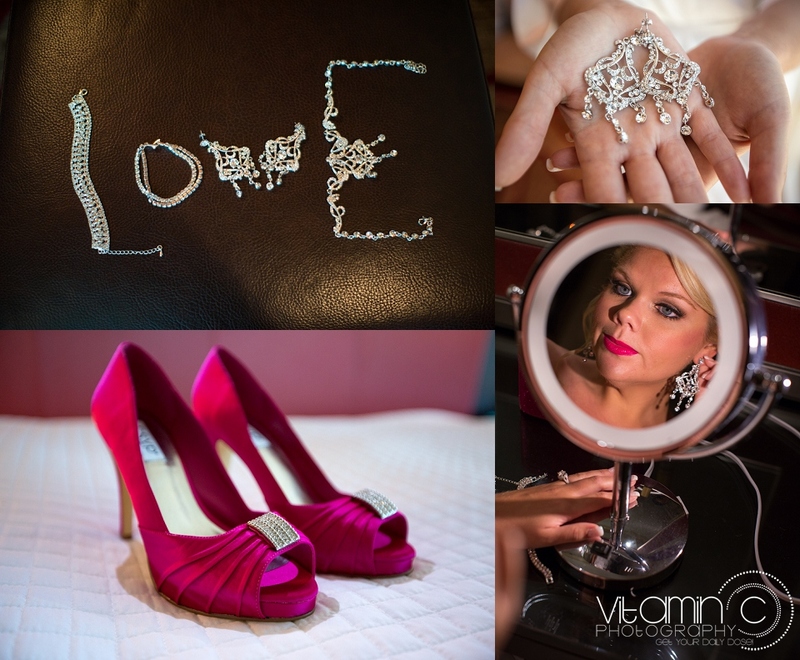 Highlighting her wedding dress was an absolutely beautiful pair of bright pink high heels and all the bright sparkling jewelry she could wear. 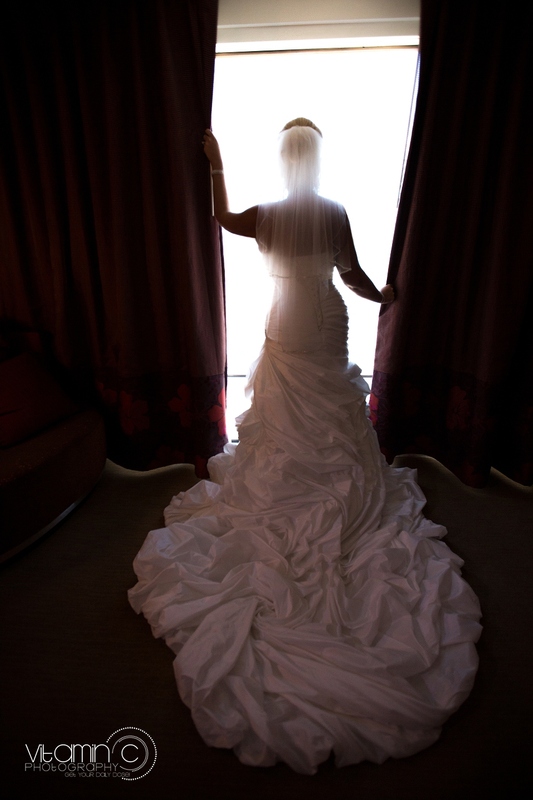 Once Lindsey was dressed and ready, they headed off to the Wynn where the ceremony was set to take place. I would have a ton of pictures from the actual ceremony, but the Wynn provides their own exclusive photographers for wedding packages, so I just met up with them again following the ceremony to take them on a strip tour! After the ceremony we hung around the Wynn and took advantage of the décor to get some shots of the newlyweds with their parents and then it was out to the street. 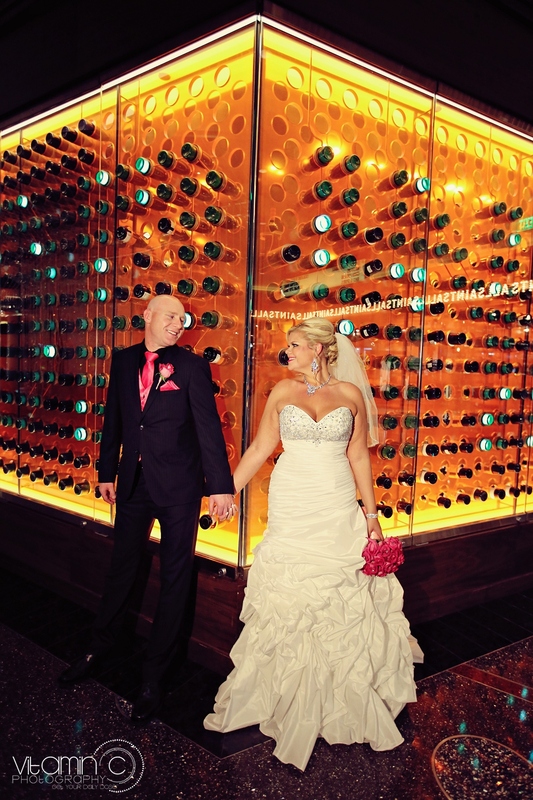 Our first stop was to head to the Cosmopolitan for some just married candid shots. 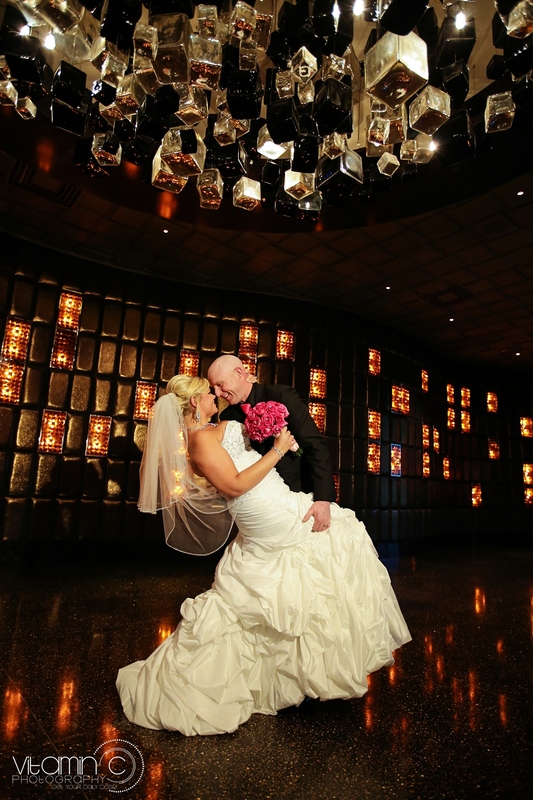 The elegant crystal strands and creative lighting of the Cosmopolitan were a perfect highlight to James’ bright pink vest and Lindsey’s already sparkling dress. 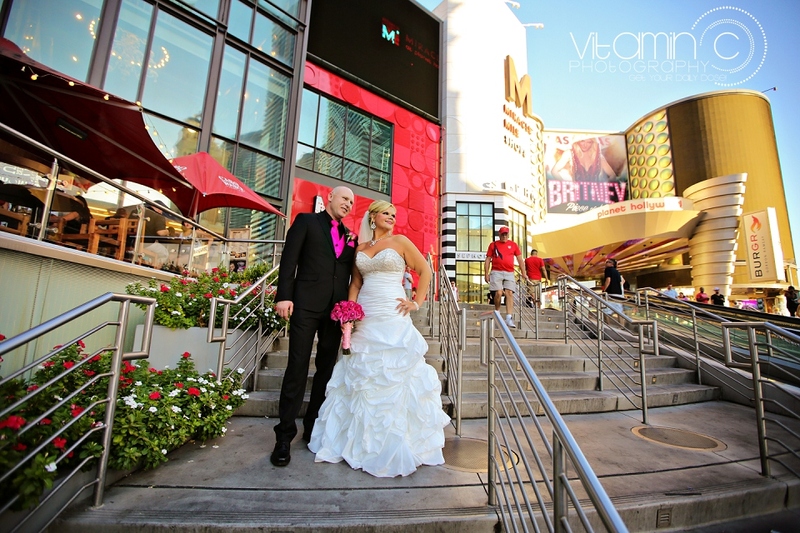 We then stopped by one of my favorite spots in front of the Planet Hollywood, where James and Lindsey seemed to be the center of attention to everyone passing by wishing them luck with their new marriage. Time was short and being late to the reception party with the bride and groom was not an option, so after some quick poses in front of the Paris’ Eifel Tower we left the strip. James and Lindsey had their reception at Maggiano’s, a classy and wonderful Italian restaurant located at the Fashion Show mall. Arriving right on time to Maggiano’s we were met by Lindsey and James’ families where everyone took a turn getting a picture with the new bride and groom. Touching toasts, great food, and a lot of dancing was had by all. 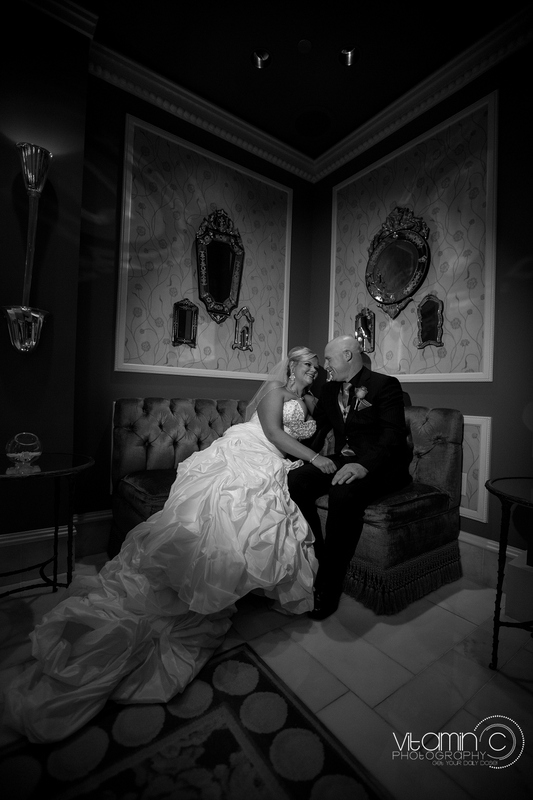 I am thrilled James and Lindsey chose Vegas as the location of their wedding and am ecstatic they chose me to capture their memories. I wish you both the best of luck in your marriage and know you’re surrounded by loving family and friends. Warmest regards from the states. Beautiful pics!! Love the last one…awwww.. The photos, as always, are fabulous and full of drama but I LOVE that jewelry shot. So creative! 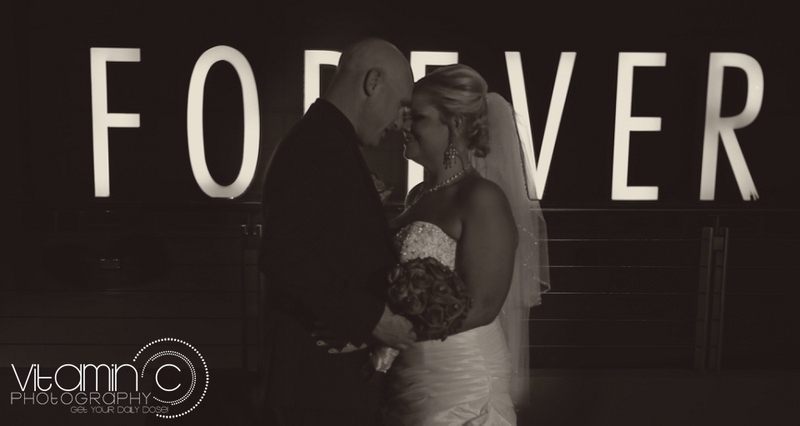 Suzi did an awesome job of James & Llindsey’s wedding pics. Very professional and innovative! The photos of James & Lindsey’s wedding were fabulous! Great poses and backgrounds. Good job, Suzie! Beautiful pictures brings tears to my eyes, Lindsey & James congratulations what beautiful memories these pictures will make! These pictures are absolutely beautiful! 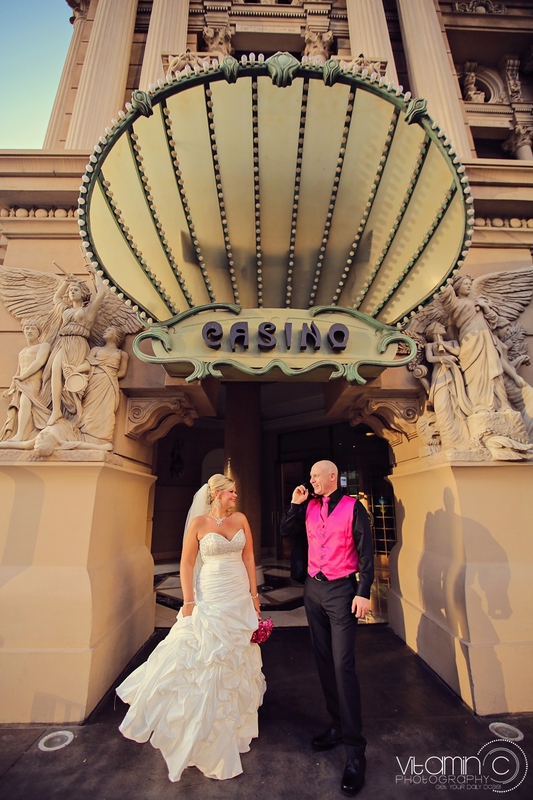 The bride was breathtaking with a gown to die for and the groom was so handsome in his hot pink vest and tie!! 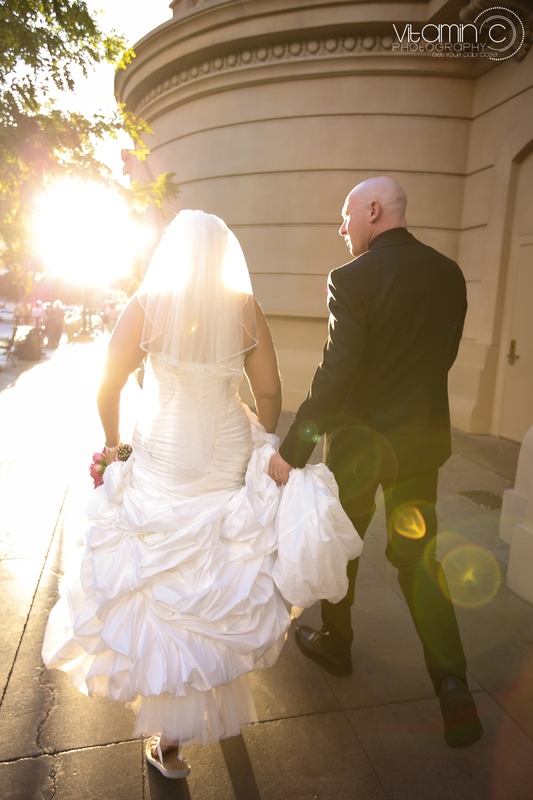 The photos brought out the beauty of the couple and the awe of everything around them. What an atmosphere! Amazing pictures! So unique. LIndsey and James you both look outstanding and are so lucky to have these pictures to remember your special day.